"Vegetarians actually can live really good lives!" That was said by my adorable mother after (sort of) eating veg with me one night at Tony Mandola's. I had driven by Tony Mandola's on Waugh probably 752 times before that day, but had absolutely no idea what it was. With its grandiose exterior and lack of obvious signage, I had always thought it was a club or an event space or some sort of secret society where the members can only wear long capes and drink out of 5,000 year old chalices (omg sign me up). Fortunately, my mother had been to Tony Mandola's before, and because she loves it so much, we started out our June weekend of eating our way through Houston there. 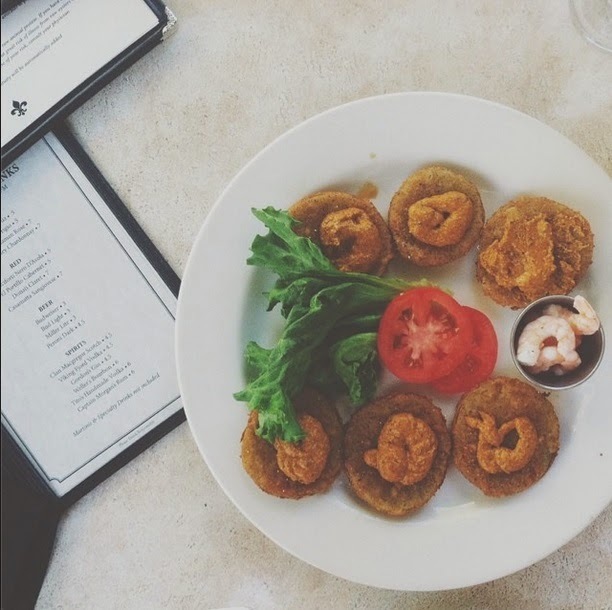 Even though we were there during Happy Hour, we started off with the Fried Green Tomatoes appetizer from the regular menu (asking for the shrimp on the side). Here's the part where I tell you that before I could get a picture, as the server was standing there, my mother dove into a tomato and started spreading the remoulade on it (see the top right tomato). I subtly tried to ask her with my eyes if she could please wait so I could take a picture, and she said out loud and not with her eyes, "Oh! That's right! You have to take a picture!" She turned to the server and said, "You see, she has a food blog!" This is the part where I not so subtly tried to tell her with my eyes, "Moooommmmm!!" and she said out loud again, "Whoops! Was I not supposed to say that? They're not supposed to know that, right?!" Coincidentally, the General Manager was over not long after, chatting with us. But he was super nice and explained that he was new there, and he was brought in to help introduce new wines as well as help bring in more crowds. It was actually nice getting to talk to him, and I was glad to hear about their new publicity effort. Because even though the food was amazing, there weren't that many people there for a Friday after work. We then were debating between ordering a side of rice and beans off of the main menu, or the Happy Hour rice and beans. My mom said the Happy Hour offering was ginormous, so we opted for the smaller (though come to find out, more expensive) side of rice and beans. It only had one hunk of sausage in it, so it was easy for me to pick around it. And sweet mother of pearl was it tasty-rich, hearty, filling, and full of character. Then we ordered the linguini primavera to share, tossed in garlic and olive oil with fresh vegetables. And it was stupidly good. First of all, you could tell the pasta was made in-house, and that it was done with super high quality ingredients. But it was also colorful, and lovely, and light, and complex, and bursting with a million different flavors! Wonderful. Also it came with a little side salad which included some artichoke and olives. A+! But y'all. This garlic bread was PERFECT. Super crunchy on the outside, buttery garlic clouds on the inside. I'm embarrassed to say this, but my mom had one little slice and I DEVOURED the rest. Oh just shut up and kiss me already. I'm so glad I got to enjoy Happy Hour (well, really the only HH item we ordered was the wine. which was good, hello) with my mom at Tony Mandola's. If the weather is nice, I definitely recommend sitting on the beautiful patio, but the inside is large and open as well. And the food is good. REALLY stinkin' good.